I like making smoothies for breakfast; they are quick, easy, and don’t require cooking. I love peanut butter banana smoothies but since I just started Whole30, I needed to replace all dairy and peanut products. My replacements? 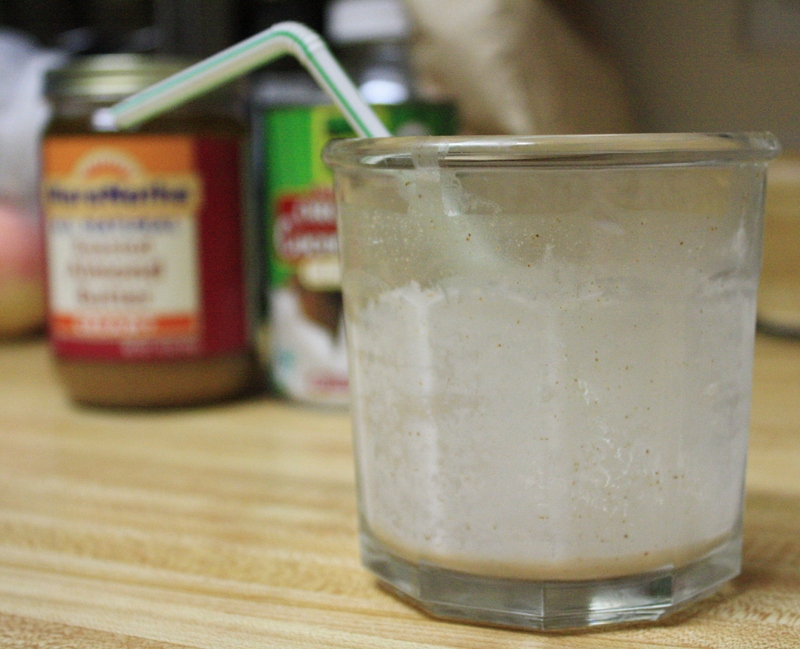 Almond butter and coconut milk! Freeze almond milk and water in ice cube trays. 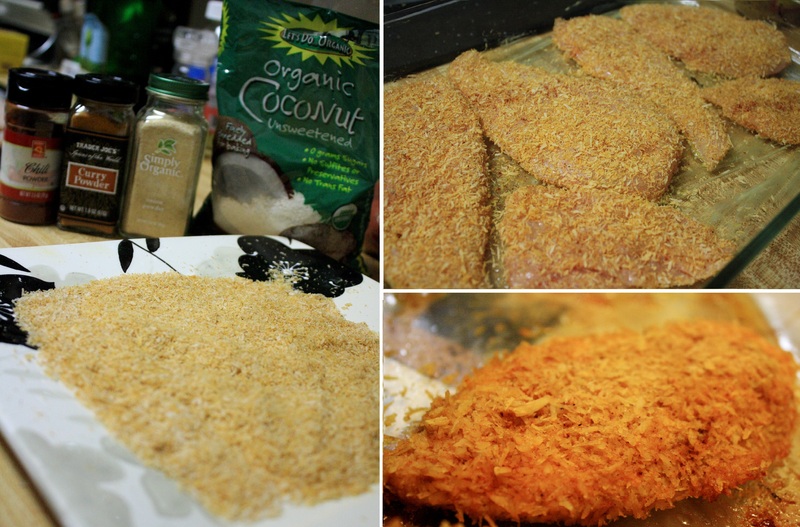 Put 1/4 cup of coconut milk divided into 3 cubes. Despite our panic eating of cookies and fast food, we still manage healthy dinners. Tonight I wanted something a little different and remembered I had just bought curry powder and coconut; coconut curry chicken was placed on the dinner menu! Bonus points because it will fit into our Whole30 diet challenge that we start on Monday and I will definitely be making it again! I bought goat cheese at the store the other today in hopes of recreating a magical coconut goat cheese tart I had a couple weeks ago. I haven’t bought the coconut yet, but I still wanted to bake something. I also didn’t want to spend a long time over a hot oven in the middle of summer. 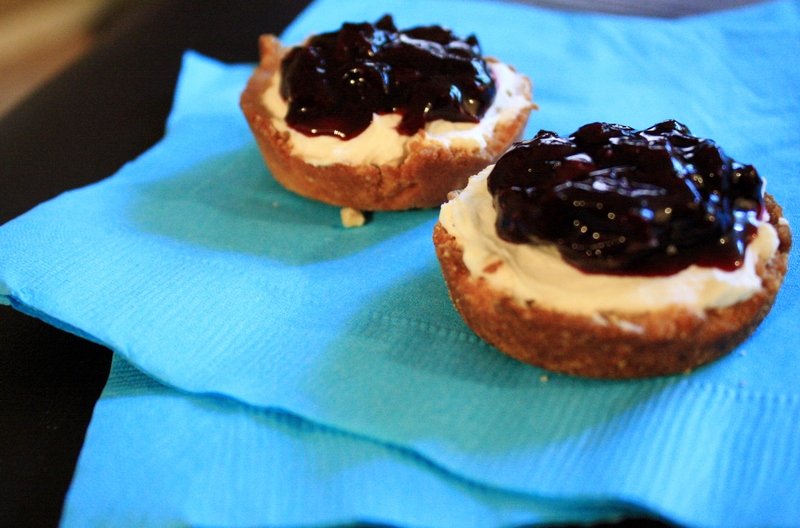 I opted for mini tarts and no-bake cheese cake filling with goat cheese. And because I still have a ton of blueberries left, I also whipped up a quick batch of blueberry compote. The little tarts taste even better after being in the fridge and completely chilled, but eating them warm won’t do any harm either. Grease muffin tins – I like to then put a little strip of tinfoil in the cups (where the ends reach above the cup) and grease that as well, so that when the tarts are cooked, the strips can be pulled up to release the cups easily. Mix almond meal and coconut flour together in a bowl. Using a pastry cutter, a fork, your hands, or whatever works for you, cut cold butter into flour mixture until crumbly. Mix in vanilla and maple syrup. Add water, one tsp at a time until mixture becomes a dough consistency and can be formed into a ball. Press dough into greased muffin tin. Poke bottom of each dough cup with a fork a couple of times to prevent dough from rising. Bake 8-10 minutes or until they start to brown and are firm to touch. Let stand for a couple of minutes and carefully remove crusts and let them finish cooling on a wire rack. In a small sauce pan, combine all ingredients. Cook on med heat, stirring occasionally. Smash berries and cook for approximately 8 minutes or so, while you prepare the cheesecake filling and finish baking the tart crusts. Place in bowl and let cool in the refrigerator. Using a stand mixer, mix all ingredients for 3 minutes or until perfectly smooth and creamy. After the tarts have cooled, gently spoon cheesecake mixture into crusts. 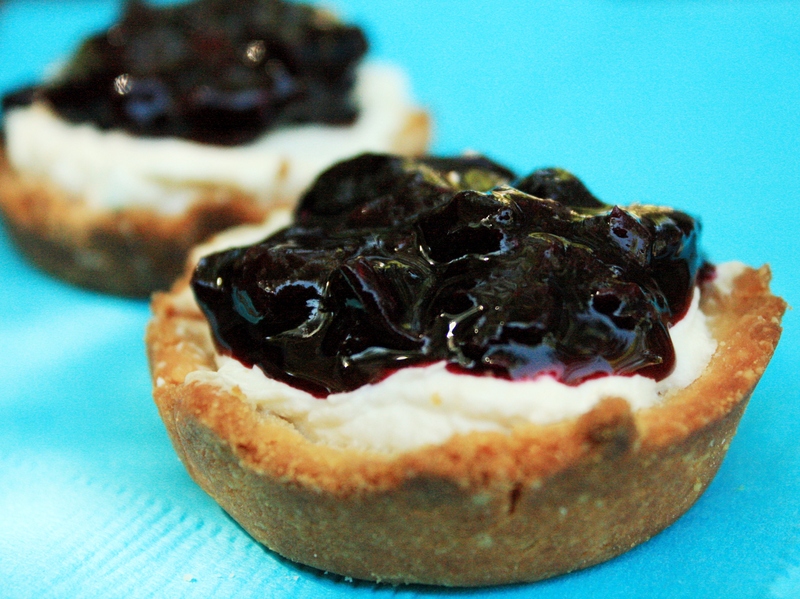 Place mini-tarts in the fridge and allow to set for at least an hour, or until firm. Serve with a spoonful of blueberry compote on top. Fruit cobbler and ice cream belong with summer. There’s just something about summer fruit and ice cream that pair perfectly with hot summer days and BBQ’s. 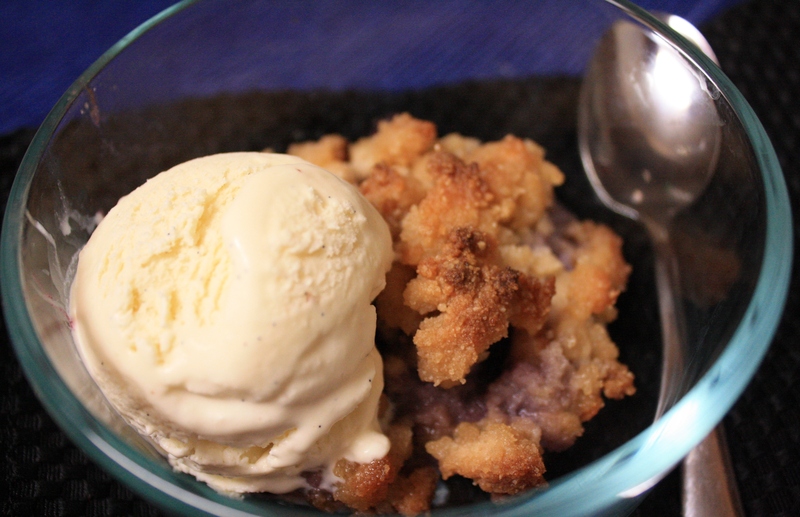 For the 4th of July I decided to make cobbler and ice cream from scratch, using no white sugar or flour. I had an abundance of white peaches (my favorite) and blueberries that seemed destined for this tasty experiment. I also replaced the flour with my trusty combo of 3:1 parts almond meal and coconut flour. For the ice cream, I used a recipe out of Nourishing Traditions and it was a crowd hit! 3 cups Heavy Cream (the book calls for raw or not ultra pasteurized, but the only cream I found that wasn’t ultra-pasteurized was about $4 a cup and a little too expensive for me. I did, however, scoop the cream off the top of our milk to account for part of the 3 cups cream). Mix ingredients into beaten eggs and follow your ice cream maker’s instructions. For whatever reason (maybe because of the arrow root) the ice cream froze quickly to the sides of the ice cream maker so that the paddle could not turn, making the ice cream maker stop. I had to scoop all the ice cream out, freeze it for a couple hours then mix it with my mixer and put it back in the freezer. Next time I will try it with less rock salt. Bake in a 9×9 square Pyrex dish or something of similar size and depth. Combine all ingredients and pour into dish. Cut butter into small pieces and scatter over top of the fruit mixture. Mix flours together. Stir in vanilla, cinnamon, and maple syrup. Using a pastry cutter, fork, or other method, combine cold butter, pieces at a time, into the flour mixture until crumbly and evenly distributed. Stir in granola. Sprinkle over fruit mixture. Bake 15-20 minutes or until top of cobbler is golden brown. Serve with homemade ice cream and enjoy! Notes – you can really use any amount of fruit that fits in a 9×9 pirex. The other day I made a cobbler with all the fruit that was about to turn – pluots, peaches, and nectarines. A cobbler is very versatile and hard to mess up. If I wasn’t trying to stay away from sugar, brown sugar is quite tasty in the topping instead of maple syrup. I made a sinful cobbler for my family and it included a cube of butter, a half a cup of brown sugar, and about a half a cup of flour. Not healthy in the least, but very good!